I woke to a slight morning chill, even as the golden orb of the sun had begun to sneak up on us. Outside our maroon and mustard tent, the sky was fast turning a deep blue to a pale gold. Inside, I groaned quietly to myself as I massaged my right knee, now swollen and puffy. Day 4 of a six-day expedition, and my right knee was suffering from an overuse injury. I turned to Shani who was just stirring inside her voluminous, caterpillar like sleeping bag. Shani shrugged. In her book, having a nice healthy knee going into one’s old age was definitely a deciding factor. I was, instead, weighing up the failure of completing the mission versus what I reckoned to be a tendon injury that might resolve after some rest. The satellite telephone lying at the foot of my sleeping bag looked inviting, even seductive. Just a call to our logistics operator and it was likely that they’d find us with their four-wheel-drive, or 4×4, in a matter of a day or so. The ‘easy’ way out lay within arm’s reach. But was that the best solution? “So when are the trolleys arriving?” I queried, slightly exasperated. Over the tinny sounding phone, the voice said. “They’re on their way tonight from Miami!” So there we were, in La Paz, the world’s highest capital at about 3700m above sea level. Landlocked Bolivia’s capital is so high, just getting out of the plane takes your breath away – literally. The oxygen level here is about 30% less than of Singapore, our wonderfully warm and sticky tropical island home. Our journey really started with a magazine feature in 1994 of Carla Perotti’s daring solo crossing in 1994, on foot, and unsupported, across the world’s largest salt desert. The Salar de Uyuni is one of the world’s most surreal places, about 170 km across. The large desert comprises a hard saltpan, crystalline salt metres thick, left behind when the pre-historic lake Minchin dried up aeons ago. 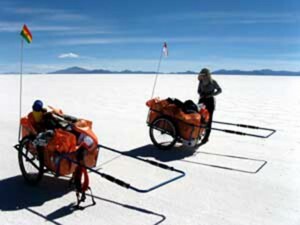 The years passed, and when the idea became a reality in late 2006, Shani and I put together a plan to pull our six days’ supplies of water and food and equipment on specially made aluminium trolleys designed by Hospimek. These trolleys were supported by lightweight alloy tyre rims and tyres picked just for the desert environment. And now the entire shipment, thanks to the incompetence of our shippers, was delayed. The days passed, each one framed with more promises that the trolleys would arrive on time. It was impossible not to have a sense of frustration and resentment in having nearly a year’s effort go to waste. But then I worked through this feeling and decided it was better to channel these into positive energy. So within 36 hours, we purchased crude La Paz trolleys made for street vendors, and had them modified at a welding shop. We also acquired some heavy China-made mountain bike tyres and accessories. We followed a routine of packing in at least nine hours of pulling with short breaks every hour or so. In many ways, it was harder than climbing, as we had to keep pulling for much longer stretches without a break. To prevent difficult-to-degrade stuff like used toilet paper from flying around the dry Salar for years, we burned every scrap after using them – quite a trick when the wind is blowing, your pants are down, and your lighter keeps getting snuffed out. So went the suggestion to which Shani demonstrated some pluck when she hauled both our trolleys. This allowed me to hobble some half and hour behind her at a much slower pace, carrying just the minimal amount of water. I was filled with doubt as to whether this solution was workable. By lunchtime though, Shani had not only got the hang of it, but it was also proving to be less of a problem than we thought. The lights of Colchani, the village at the edge of the desert could be seen. Not far now. At about 1030 am the next morning, on Aug 10th, 2007, we walked through the grubby salt mines that ringed the edge of the Salar until we reached a metalled road. My left ankle was now swollen from all the weight I’d put on it to ease my injured right knee. But it was the end of our journey, and I’d survive – even if on the back of a handful of painkillers. But it was not the end of learning. The hardest won lessons from the desert was that in the face of setbacks, only two things matter – first, the strength of your commitment to a shared goal, and second, your attitude in being a solution-seeker, rather than a problem-dweller.